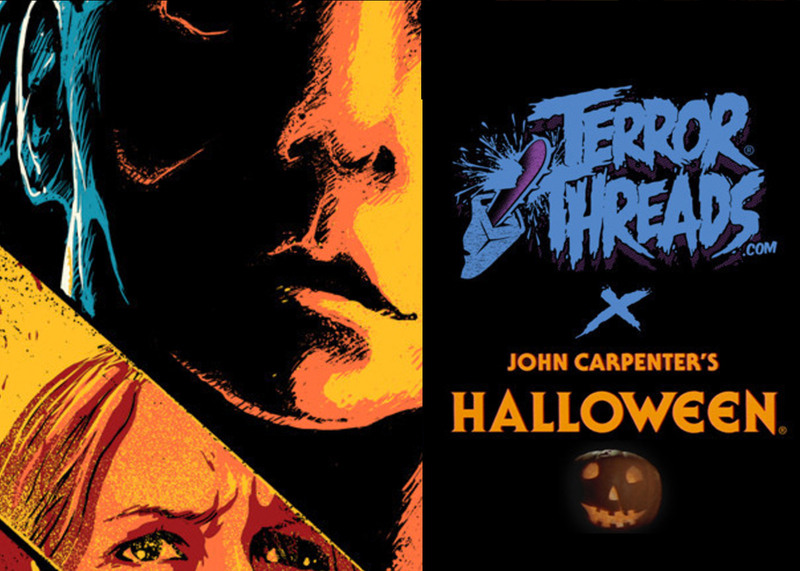 Our friends at Terror Threads are releasing an officially licensed line of Halloween (1978) shirts, featuring incredible artwork and a black light reflective design! Like most horror fans, I’m OBSESSED with John Carpenter’s 1978 slasher classic, Halloween. I’ve never met a fan of the genre who didn’t love and revere this film and, for many of us, it’s the film that began our love affair with horror. Halloween helped pioneer the slasher genre, launched one of the most successful and beloved franchises, and gave birth to arguably the most iconic movie villain to ever grace the screen — Michael Myers. It launched the career of the woman many fans consider the ultimate scream queen, Jamie Lee Curtis. It encapsulates everything that a good horror film should be and is still considered one of the all-time greats to this day. 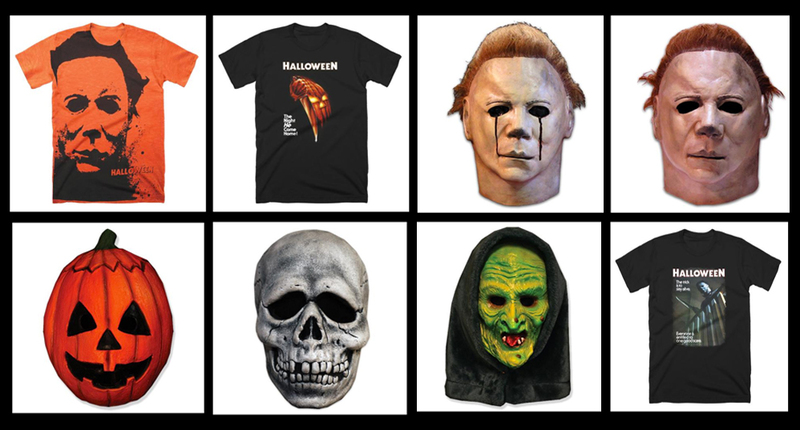 Because of my love for the film, I was ecstatic when one of my absolute favorite horror shops, Terror Threads, announced late last year they had obtained the rights to produce officially licensed Halloween merchandise. I’ve been a fan of Terror Threads since day one. From the launch of their very first original t-shirt design, it was clear they had something special. And it’s been such a thrill to watch them grow. 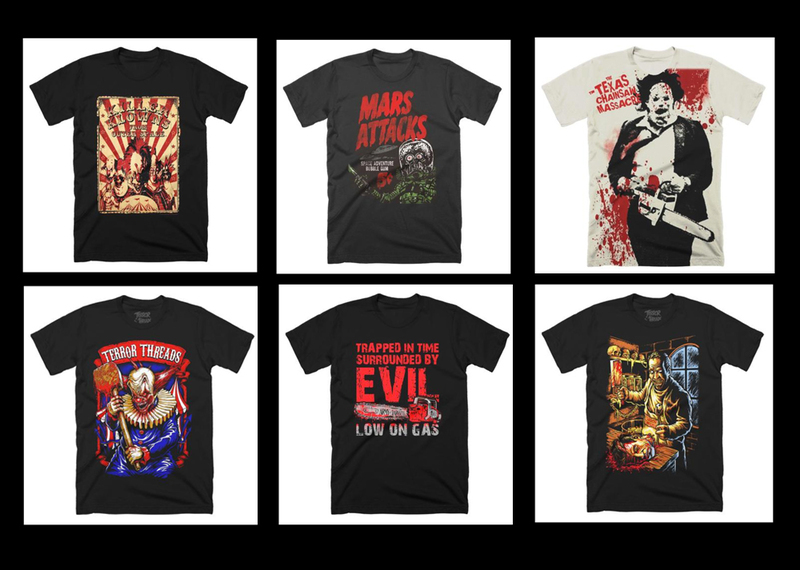 Once the new designs for the HALLOWEEN collection were revealed, four designs featuring art from Terror Threads designers Toto6 and Ryke1, I was blown away; they were even better than I could have hoped for! The first set of shirts, shown below, will be available to order beginning Thursday, February 9th. I was able to chat with Terror Threads owner Rick Davis about the new collection, the success of his business over the past year, and what fans can expect next. I know I probably speak for many about how excited us Horror fans were when we first found out about you obtaining the license for Halloween last year, it’s obviously HUGE! How do you feel being one of the very few select vendors being able to offer this for horror fans? We are just as excited as you, trust me! To be able to obtain a license for such an iconic Horror movie such as “Halloween” is crazy in itself, for it to be our very first license is beyond anything we could have asked for. It’s still kind of surreal to us. Halloween means a great deal to a great many fans. What does the franchise mean to you? What drove you to wanting to obtain this license? We are well aware the impact this particular movie has on Horror fans as we ourselves feel the same way. This film is what started many Horror fans love for the genre. We are doing everything we possibly can to represent this film the right way and hopefully pleasing our customers by doing so. Can you talk about the designs for the first release and the inspiration behind them? First and foremost, we wanted to create designs that have not been seen before for Halloween. We also wanted to be sure to include a design that would have a “wow” factor if you will, something that we ourselves have not seen before in regards to Halloween. Then we thought why not a design created with black light reactive ink? We knew it maybe a little tricky getting the opacity of the ink the way we wanted. But we made it happen, and our “Night of The Boogeyman” design was born. We also knew we wanted to have a design solely feature character Laurie Strode in all her knife swinging glory, and our design “Joke’s Over” was born. Lastly we definitely wanted to have a couple designs that just had that retro feel, as if they were actually designed in the late 70s when the movie was released. These would be our “He Came Home” and “Death Has Come” designs. We pride ourselves on quality through and through. However, this collection of designs pushed us beyond anything we have been through before, considering how important this was to ourselves, the licensing company and the fine folks at Halloween. I myself am a bit of a perfectionist, and I will always find things wrong even when no one else can see it. I drive our staff crazy at times with how bad I am, and I can wholeheartedly say this collection is the best set of designs we have ever produced! We are all very proud of what we have accomplished with this collection, and we hope everyone that purchases feels the same way. Can you tell me about the future release plans? Yes, the first half of this collection consists of 4 designs available on Men’s and Women’s Tees as well as Unisex Baseball Tees. These will be released at 12pm EST this #TerrorThursday February 9th. The release of the second portion for this collection is still yet to be determined. As you may or may not know, we print all our designs in house. So, depending on how well we keep up with the demand of the first half of the collection will play a big factor as to when the second half will be released. The second portion of the collection will include designs from Coki Greenway and Terror Threads designers Toto6 and Ryke1. Any plans to do any other Halloween-themed merchandise? As of right now it’s strictly apparel for the Halloween releases… BUT you never know if that may change. 😉 We do have some other shirt styles up on the shop, along with a variety of Halloween masks. Being able to release officially licensed merchandise from one of the most beloved horror franchises of all time is incredibly huge. And this comes right on the heels of your one-year anniversary. How surprised have you been about the tremendous success of Terror Threads? Has it exceeded your expectations? Honestly, it has most definitely surpassed what we thought we would accomplish in just a year’s time. The Horror community has been absolutely AMAZING to us! We cannot thank them enough for all the support they have shown us and continue to show us every day. To what do you attribute your success in such a competitive market? How do you differentiate yourselves from the competition? Because we are Horror fans before we are a Horror brand, we feel we know what other Horror fans are looking for. We don’t just sell this, we live this. We are not just doing this for financial gain (although it helps). We are Horror fans who LOVE this genre, and we’re just thankful we get to come into work every day knowing we are going to create some sick Horror products for other Horror fans to enjoy. We ourselves want what our customers want plain and simple. Killer Horror products, wide selection with great customer service. What’s next for Terror Threads? Any other big plans for this year you can tell us about or tease at all? What are your goals for 2017? Well, we can say that we are slowly expanding into all things Horror not just apparel. In fact, we have already started adding Masks from some of everyone’s favorite Horror movies (including Halloween). We could see us being a one stop Horror shop at some point. You just never know with us… we really enjoy keeping everyone guessing! We like to be able to surprise people. It’s worked for us so far, and we don’t plan on changing that. We cannot thank the Horror community enough. I know I have already said this, but I have to stress how important they are to us. To embrace our brand the way you have in just a year’s time is completely amazing! Because of you. we are able to take Terror Threads to places we only dreamed of. Thank you, thank you, THANK YOU!